Homemade Cheesy and Creamy Pumpkin Alfredo Sauce served over pasta makes the perfect fall dish that your whole family will love. Welcome to your new favorite pasta dish for the fall! How was your weekend? Mine was great but COLD…very cold. Don’t judge me, but my Christmas tree as well as all of my holiday decorations have made their appearance. I held out as long as I could and just couldn’t wait any longer. My nine foot tall tree is there in my living room in all it’s glory…with the beautiful, colorful lights gleaming so bright that you can see from all the way down the street. All of you, along with all of my neighbors, are judging me…I can feel it. I love the Christmas season so much and just like to see it last as long as possible. Nothing wrong with that, right?! I’ll keep telling myself that. This Pumpkin Alfredo dish I’m sharing with you today is an easy, no-fuss dish you can make right at home. I have already made it several times so you can trust me that this is worth your while. It’s also on the cheaper side to make and quick for a weeknight meal. It contains simple ingredients and the sauce is SO great that you can use it in a variety of creative ways. This pumpkin Alfredo sauce renders a smooth, rich coating on the pasta and the pepper adds some spark to the richness of the sauce. The flavors in this sauce are just perfection. Serve this with a side of fresh broccoli or cauliflower if you make it (and you really should). Enjoy! 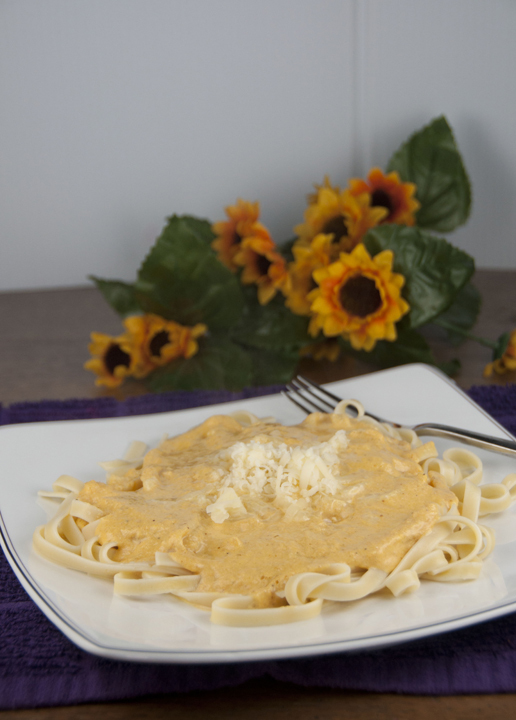 Cheesy and Creamy Pumpkin Sauce similar to an Alfredo sauce and served over pasta makes the perfect fall dish your whole family will love. Melt butter over medium heat in a sauce pan. Add minced shallots and garlic and sauté for about 3-4 minutes, stirring occasionally. Add pumpkin puree, nutmeg and ginger to pan and stir to combine. Add milk and cream to the pan and stir to combine. Raise heat and cook until mixture just begins to boil. Keep stirring occasionally so it doesn't burn at the bottom. Reduce heat to low and simmer for about 5-7 minutes. Mixture should begin to thicken and slightly reduce. Spoon sauce over noodles, garnish wish some extra Parmesan, and serve immediately. I love your Christmas tree pride. Go, you! 😀 And this looks SO creamy! I love Alfredo sauce but the idea of pumpkin Alfredo sauce seriously blows my mind. This looks amazing! Mmmmm. Pumpkin Alfredo sounds wonderful! I love the creamy goodness! I’m not judging! I keep asking my family when can we get the decorations up! I just love the Christmas holiday so much I want it to last longer! 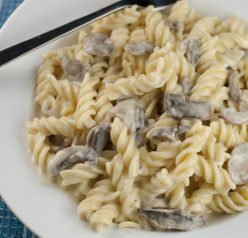 This pasta is a family favorite as well! I could have eaten at least servings of this over the weekend! 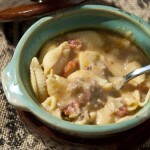 It was cold and windy around here, and this pasta looks like comfort food at its best! This looks RIGHT up my alleyway!! I love alfredo sauce…and the addition of pumpkin sends this completely over the top! Looks amazing! Oh yes, I’m loving the idea of a creamy alfredo infused with pumpkin! I want. Wow, does this sound great! Brilliant! 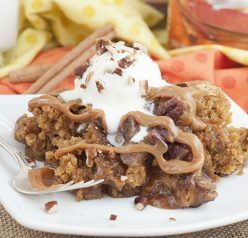 This holiday season, its nice to have quick and easy recipes like this on hand – thanks Ashley! This is so different. I would make it! I might make this for dinner tonight! Sounds delicious! I think it is so fun that your Christmas tree is up already. Your Creamy Pumpkin Alfredo Pasta is so original too! Alfredo Pasta with pumpkin; sounds fantastic. I’ve been wanting to try a pumpkin type sauce for the family for a long time, haven’t yet tried it, but yours looks great! We haven’t brought out the Christmas decorations yet, but we are diving into pumpkin dishes at every turn. This pasta dish looks like the ultimate comfort food. This is the perfect comforting dish! It looks insanely creamy. I hate this cold weather, but I’m not mentally prepared for my Christmas decorations. Not yet anyway. What a great pasta dish for this time of year, so comforting and healthy! My Christmas tree would totally be up if it weren’t for my husband. 🙂 I’d eat a big bowl of this while sitting by it! I make a pumpkin cream sauce thats similar to this and is awesome, so I just know this recipe will rock too! Ooh, I love alfredo and adding pumpkin sounds even better! Love the idea of using pumpkin in a cream sauce! Delicious! I love using pumpkin to make a creamy pasta sauce. ooo I’m judging….. totally.. haha just kidding. 😉 I’m still in the “ALL THINGS PUMPKIN” mode so this pasta is perfect! This pasta looks fabulous, and something I never would’ve thought of Ashley! I can’t believe you put up your tree already! I am totally not judging! I am just not that organized and prepared! Hahaha! I love everything about this….pumpkin and alfredo sauce belong together. I just never knew it! I’m impressed that you have your tree up already. Ours seems to go up later and later each year. Love this pumpkin pasta. The combo of pumpkin, cream, cheese and spices sounds divine!